Just a simple puzzle review today. I again haven't really had lots of spare time recently to play with my toys. The NHS is busier than ever and the pressure is on to get stuff done - the downside of this is I seem to have finished work late every day and been too tired in the evenings. 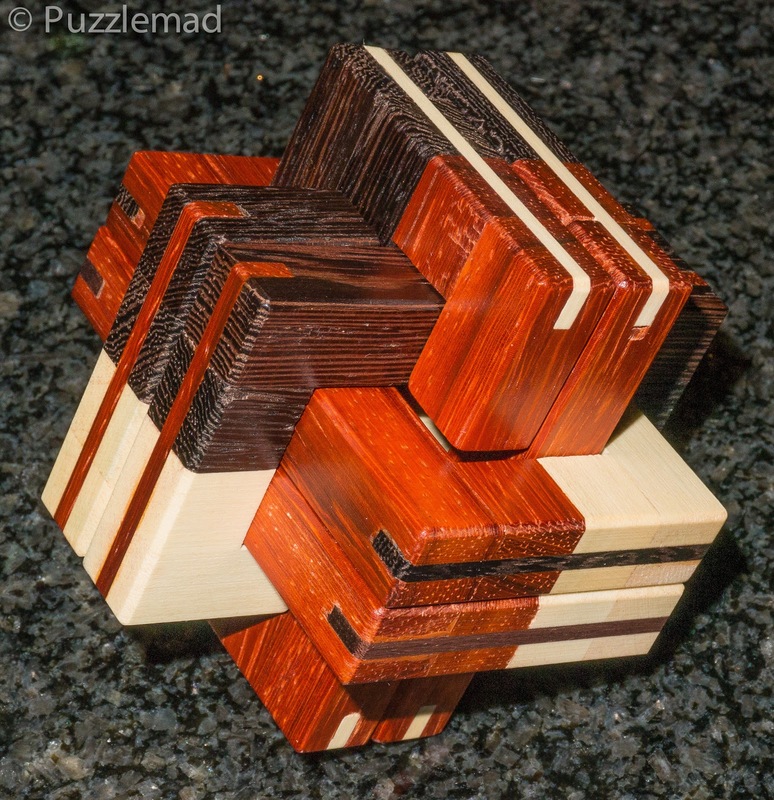 When this puzzle was recommended to me I was at first skeptical about making it. I love making board burr puzzles but the reinforcing splines were necessary and add to the cost, and, I didn’t know what made it special. Well, was I ever wrong. This puzzle has a few moves in the middle that just leave you saying “Why did I have to do that!” I think it is truly unique. The splines, needed for reinforcement, are a part of the three-color scheme. With a unique solution, it provides quite a challenge; and as I said earlier, some of the moves are, in my mind, quite special. Lacquer and wax finish. Knowing who had recommended this puzzle I just knew that there would be something truly wonderful about the solution. He tends to be fairly skeptical about a lot of the new Burrtools designed puzzles and only when one has something truly exceptional will he say that it is good. As soon as it came up for sale, I nabbed it. Unfortunately the vagaries of Brian's shopping cart system meant that he sold more than he had and I had to wait a week or so for new ones to be made. When it arrived, I was astonished at how gorgeous it was - the workmanship is beautiful and finish with Lacquer and wax is stunning. All the edges are bevelled nicely and everything slides nicely. The splines may have added to the cost but they really turn the puzzle into a thing of beauty. Initial fiddling revealed quite quickly how the first piece comes out in just 3 moves but after that it gets more tricky (but not dishearteningly so). The puzzle remains remarkably stable unlike many board burrs and as far as I can tell there are no illegal rotational moves possible. The Tricolore could also be called "Dancers" because of the incredibly unusual moves that are required during the solve where a couple of the pieces dance around each other in a VERY unexpected way. Until you discover those dancing moves there seems to be very little possible but after the dance the pathway is open. Even more surprisingly the dance needs to be done again but differently before another sequence can be done. Do you dare to scramble these pieces? Well I would say that you should - this puzzle is not one that I would want to do a "Brokenshire" and solve entirely from the unassembled state (I am just not in that league) but having spent a while playing to disassemble it I felt that I had gained enough knowledge of the puzzle that I could reassemble it again. Luckily I have proven myself correct as I have managed to assemble it without needing to make a Burrtools file (of course I will do so just for the fun of it). This is a truly wonderful design and beautifully implemented by Brian - I can't believe that there is still one available..... or maybe there isn't any longer now that you have all reached the bottom of this post?